Buckingham Schools: Plank Road Academy | slate river ramblings . . . . 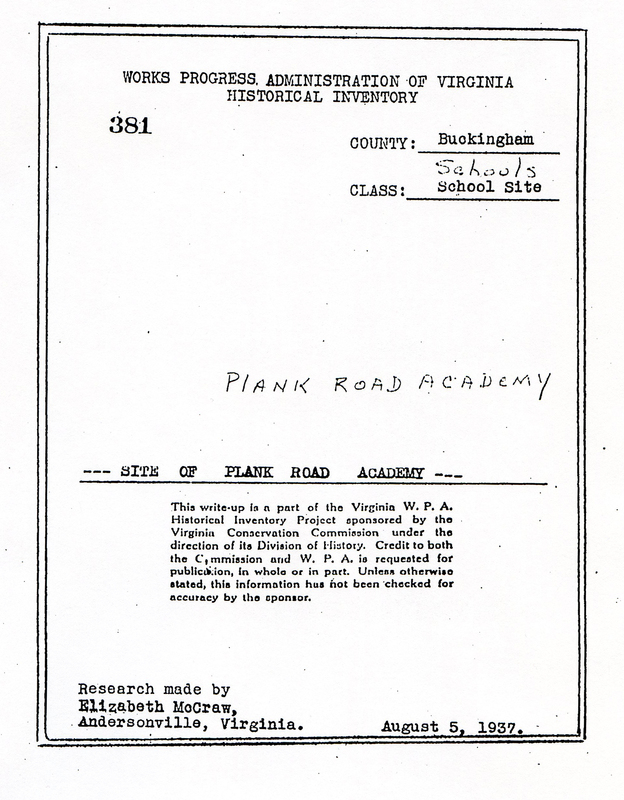 In 1937, Elizabeth McCraw surveyed the site of Plank Road Academy for the Virginia Historical Inventory. Located about a mile north of Andersonville, the one-room building was no longer standing, so Mrs. McCraw interviewed former pupils of Plank Road Academy. Mr. Branch Gilliam was known as an excellent teacher and disciplinarian of his day. He always had an assistant teacher, usually a woman for the girls. One former pupil recalled that Grammar, Arithmetic, Dictionary, and Philosophy were taught. Pupils were expected to learn a dictionary page per day, and on Friday, “spell over” the week’s assignment. “The school had the reputation of being quite a ‘Courting School,’” McCraw charmingly concluded. There were several intermarriages among the students: Inez Anderson and Richard Morgan, Mary Lou Holman and Wiley Jones, as well as Betty Gilliam and Emmett McCraw. Principal Gilliam also fell under the “courting spell,” marrying Miss Nannie Steger, his assistant teacher.